We thrive on providing telecommunication products and services that enable them to deploy, expand and extend wireless network infrastructures around the globe. Founded in 1991, Star Microwave is a leading global microwave equipment value-added-reseller (VAR) and service provider of wireless communications solutions to Energy and Utilities, Telcos, Enterprise, ISPs, Education, Transportation, Broadcast, and Government customers. Star Microwave provides a complete solution for supplying, deploying, and maintaining your wireless networks. Whether deploying new networks, maximizing your network availability, facilitating network maintenance, or maximizing your return on investment, we offer a complete solution for every stage of your project. We resell new and reconditioned products from leading wireless manufacturers such as Alcatel, DragonWave, Exalt, Harris (Farinon), Orthogon, Proxim (Western Multiplex), Stratex Networks (DMC) and others. Our inventory includes radio parts, complete systems, and accessories to help our customers deploy or lengthen the life of their networks. 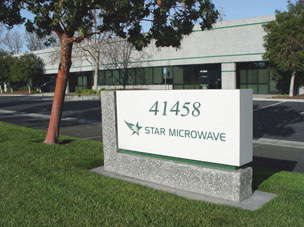 Star Microwave services include Fast-Turnaround Repair Services – Star Repair, Asset Recovery, Advance Exchanges, Trade-In Services, Best-in-Class Technical Support, Training, Engineering Services, and Extended Warranties. Our extensive, in-house repair facility provides repairs, reconditioning, retunes, and modifications of legacy radio equipment. To meet our customer’s service demands, we offer one of the fastest repair and exchange services in the industry. We retain an extensive inventory of spare parts and complete radios covering a wide range of radio models. We perform rigorous and comprehensive testing on every part as required by the original manufacturers. To ensure that our customers get the most out of their systems, and are able to maintain them more efficiently and effectively, we offer hands-on training in your facility or ours. To maximize your return on investment, Star Microwave will buy your existing equipment when it is ready for major overhaul or replacement. Our asset recovery services offer flexible equipment trade-ins and buy-back options for your convenience. Star Microwave has become the vendor of choice by providing solutions coupled with an experienced technical team (over 20 years experience) in engineering, repairs, technical support of high-end wireless equipment, and renowned customer service.